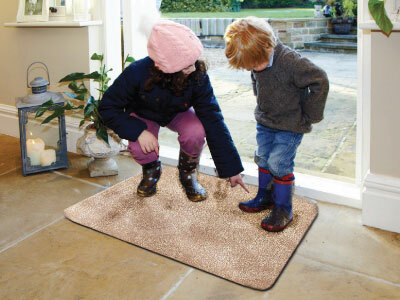 The Amazing Mat is great for any household that has children and/or pets. Placing Amazing Mats in practical locations will help you to avoid extra cleaning because of the special fibers that absorb liquid and trap dirt, pollen and other grime like magic. Pets, children, and even adults don’t wipe their paws or feet when they come into the house or before they get into vehicles. 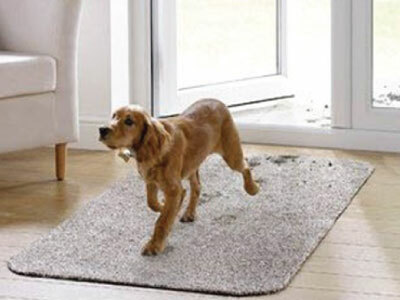 Even if they did, an ordinary mat isn’t nearly as dirt trapping or absorbent as an Amazing Mat. Placing one at every entryway will keep pollen, mud, dirt, sand, etc. off floors and carpets. Pets aren’t the neatest eaters and drinkers. Often more water ends up on the floor than in the dog’s water bowl. An Amazing Mat placed under your pet’s dishes will catch all of these spills keeping the floor around the bowls clean, dry and safe from slips and falls.A litter box is haven for bacteria. When cats – and even some dogs – leave their litter box, they track litter and bacteria onto the floors. Having an Amazing Mat at the litter box for pets to step onto will trap the litter and moisture that harbours harmful bacteria making a safer environment for pets, kids and other family members.